Chris just let me know (July 19, 1999) that he purchased this truck. He said he and his dad always wanted one and now that his dad is gone, he decided to fulfill both their dreams. "The truck is about 99.5% stock, from what I can remember from my youth, and in really nice shape. I can't remember the serial number off the top of my head, but it is in the 15,500 range. All original engine, drivetrain, interior, electrical, etc. I have been reading the service manual, and doing little tasks until I'm familiar with the truck." 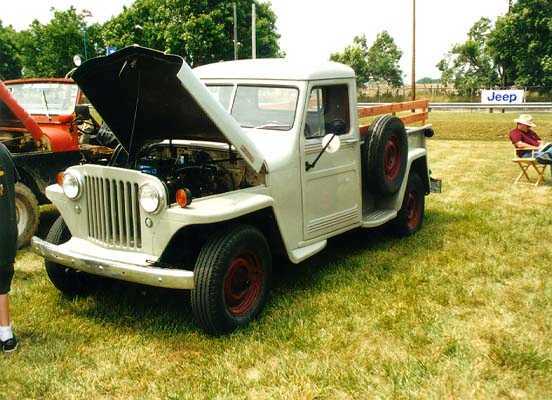 These photos were taken by Frank Sanborn at the 1998 Toledo Jeep Show. This looks like it is totally stock, except for the amber signals on the front fenders, which were a common add-on to satisfy vehicle inpection in some states. 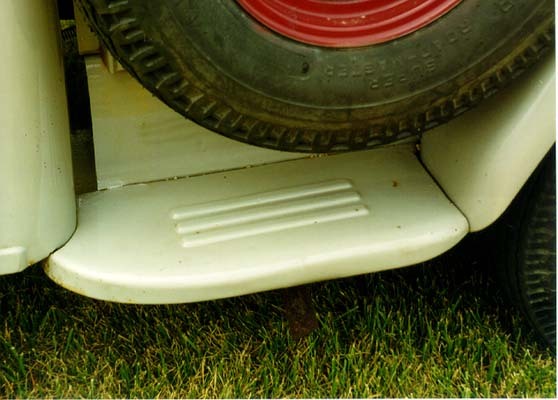 The stake sides weren't stock, but the stake pockets were there so that you could put sides on if you wanted them. Notice the stock wheels, front bumper, front bumper pan, steps behind the cab, and the low-mounted external mirror. The gray is one of four colors that were stock in '48. Either this has been kept indoors for 50 years, or someone did a great job of restoration.